High above the spiral Milky Way, astronomers have spotted two clusters of new stars growing at the fringes of our galaxy. 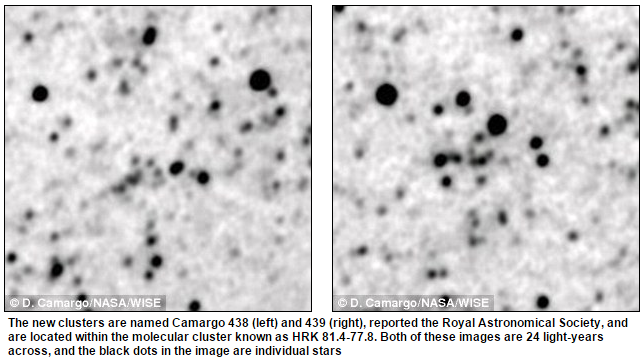 The discovery, led by Denilso Camargo of the Federal University of Rio Grande do Sul in Porto Alegre Brazil, published in the journal Monthly Notices of the Royal Astronomical Society, appears to be the first such stellar cradles found outside the galactic disk. If any planets were to form around these stars, inhabitants would see the entire glory of the spiral galaxy above them in their night sky. Previously, it was only thought possible for stars to form inside giant molecular clouds (GMC) located in the inner part of the galactic disc. Within these clumps, many stars are born together in clusters. Dr Camargo and his team discovered several GMCs above and below the disc of our Milky Way. But they were shocked to find that one GMC 16,000 light-years from the galactic centre contained two clusters of stars forming. Their location is towards the outer limits of our galaxy – far enough that they would see the entire splendour of its spiral above them, but not so far that they are not classified as being in the Milky Way. Denilso believes there are two possible explanations for these clusters location. First could be the Chimney Model according to which violent events such as supernova explosions eject dust and gas out of the galactic disk. The material then falls back, in the process merging to form GMCs. The other idea is that the interaction between our Galaxy and its satellites, the Magellanic Clouds, may have disturbed gas that falls into the Galaxy, again leading to the creation of GMCs and stars. “Our work shows that the space around the Galaxy is a lot less empty that we thought. The new clusters of stars are truly exotic,” Denilso said.